TYKE TUESDAYS SUMMER KIDS CLUB REGISTRATION - NOW OPEN! 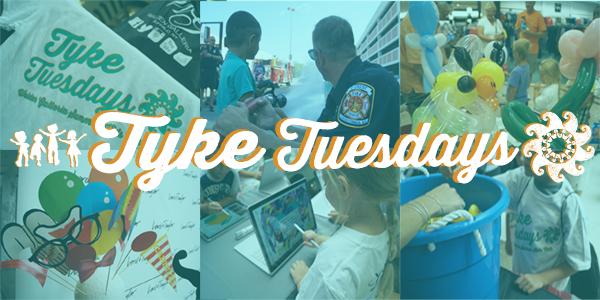 Tyke Tuesdays is Walden Galleria’s Summer Kids Club! Enjoy FREE activities every Tuesday starting on July 10th through August 28th! Check-in closes 30 minutes after start of event. Registration for each event will close approximately one (1) week prior to event date. Calling all sweet tooths! Decorate cookies and other tasty treats with Chef Larry & Chef Lisa and take them home to share! This event has 3 separate sessions. Session 1: 10:00AM-10:30AM. Session 2: 10:40am-11:10am. Session 3: 11:20am – 11:50am. *The first 50 kids outside of Dave & Buster’s interior entrance will receive one (1) $10 rechargeable Power Card on a first come, first serve basis. Arrive early! Learn how to fight fires with U-Crest volunteers! Get suited up, hop on the truck, and use the water hose to help put out a fire! Please select the event dates you plan to attend! August 21st • Fire & Safety Day with U-Crest Fire Dept. As parent or guardian of registered Member(s), I understand that I am solely responsible for the supervision, control and safety of the Member(s) at all times and that I agree to personally accompany the Member(s) to all Program events attended by the Member(s) and to stay with the Member at all times. Yes, I would like to receive news and updates from Walden Galleria. While supplies last. Shirts and gift bags not guaranteed. All events and promotions subject to change without notice. Recommended for ages 12 and under. Please note that Walden Galleria photography will be on site. Management reserves all rights.